In the Autumn of 2005 I joined a 'Creative Writing' class run in Totnes by Chris Waters. Over the course of the next nine months we experimented with various forms of writing - memoir, poetry, reportage, short fiction and drama. It was a very enjoyable course. To my surprise it was drama that I found most enjoyable and attractive. By the end of the course I'd written a large part of a full-length, three-act play and soon after started writing film scripts. In October 2007 I went on a terrific five day Arvon Foundation residential course, run by Alan Plater and Michael Chaplin, with Paula Milne as Guest. None of my work has been published, but that first play, "Proposals", is to be found here. It's worth explaining first how it came into being. During the "Drama" module of the class, Chris set us a simple class exercise. He gave each of us a picture taken from newspaper drama review sections. The picture I got was the one below. We were asked to write a few lines of dialogue to accompany the picture. 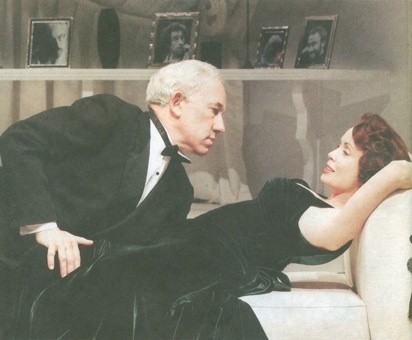 At the time I didn't know what play it was from (it's actually Simon Callow and Lysette Anthony in Noel Coward's "Present Laughter"), but it was clear from the picture that (a) the male character must be an actor (given the photos behind him) and (b) the two are not married. In class I wrote a few lines of dialogue (which appear right at the start of "Proposals") and Chris suggested we might like to continue the exercise for that week's homework. The image that I'd been given proved a wonderful catalyst. Within a couple of days most of the first act had written itself! Over the next few weeks I wrote the rest of the play - the first piece of drama (and by far the longest piece of fiction) I'd ever written. It's perhaps worth pointing out that large chunks of the play were dictated to me by one of the characters (Roxy) who insisted on writing most of her lines herself. Like Peter Philbin in the play, I found this an unpleasant experience! The play itself is to be found here. Readers should be warned that the play contains a certain amount of sexual innuendo (inspired by the way Simon Callow has his hand on Lysette Anthony's thigh).